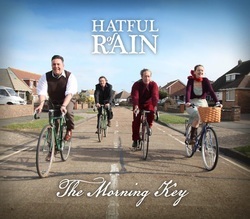 For the uninitiated this talented band is made up of four musicians based in Sussex. They are Chloe Overton on vocals, acoustic guitar, mandolin, James Shenton on violin, Phil Jones, vocals, bass and banjo and Fred Gregory on vocals, guitars and mandolin. In the early days of the bands formation they were a duo, with Chloe being the only original member now remaining, but gradually Phil, Fred and James became involved and it’s been a fascinating and entertaining trip to follow their development as a band. The four of them have now been together for several years, a period that includes their excellent debut album ‘Way up on the hill.’ They have gradually generated more and more interest thanks not only to their recordings but in particular their live shows which consist of always excellent playing and singing, as well as entertaining banter, that immediately gets the crowd on their side. The roller coaster of emotions that they take you on with their often sad murder ballads is entwined with some good old fashioned rock and roll, although never straying too far from their bluegrass/folk/old timey roots. If you get the chance to see them live, take it, they start their first British tour soon and dates and venues can be found on their website. Initially Chloe was responsible for virtually all of the early songwriting but gradually as their confidence grew in themselves and each other the three men have developed their writing to such a degree that whilst numerically, Chloe still dominates, qualatitively there is virtually no difference. James is a classically trained violinist, whilst Fred is a member of the also excellent Porchlight Smoker and Phil has played with, and continues to play with on occasions, numerous other bands, including the Curst Sons, so the experience and quality is there for all to hear. Chloe in many ways has provided the solid generic base from which she and other three have built their distinctive sound and varied styles, all within the loose confines of the already mentioned roots sub genres. Whilst their debut album was excellent this follow up seems to have a greater confidence about it. The playing was always of a high quality and Chloe’s beautiful vocals provided the roller coaster of emotional content, with Phil and Freds leads adding variety to proceedings. It is the harmonies that , overall, seem to lift this album a notch above it’s predecessor. Those harmonies are so good that they actually emphasise and give a lift to the always excellent lead vocals. When you add the fact that this is probably brought about by the extra confidence that Phil and Fred , and indeed the band, have in their lead vocals the quality levels are consistent throughout the entire recording, but it is always Chloe’s beautiful vocal that fingerprints their sound. The songwriting is all excellent, this album containing some of the most melodic roots music you are likely to hear anywhere, allied to the always excellent lyrical content. What more can anyone want? On many albums by bands playing in this loose genre by the end of the recording a little boredom has set in and the listener is crying out for a little diversity. Not so with this tremendous album. There is plenty of scope in the genre for variations and this band is able to take advantage of that scope! Certainly Chloe’s vocal gives their music its signature sound but Phil and Fred’s songwriting and lead vocals add a different slant to the bands style, contrasting thematically as well as vocally. Add to this a tremendous James Shenton penned instrumental, Stranger, and you have pretty much a complete range of musical tones and textures. It was difficult to decide on which songs to highlight simply because of the consistently excellent quality but here goes! Second track in is the beautiful Chloe penned Cannot Be The One, with its lovely mandolin and fiddle meandering through this slow moody song, with a heartfelt lead vocal from Chloe and tremendous harmonies from the men, something that adds impact and depth to the song. Those harmonies, whilst good on their first album never seemed, to me at least, to match the heights attained on this recording, whilst the occasional dobro adds even more warmth and atmosphere. One Promised Land was written by both Chloe and Phil and is yet another haunting beauty. There is just James violin supporting Chloe’s atmospheric lead vocal and the terrific band harmonies that seem to deepen the eerie sound on what could easily be a hundred year old murder ballad, but is actually a brand new 20th century ‘old timey’ ballad! Broad Wooly Back was written by Phil and really tugs at the heart strings being the story of his efforts to come to terms with his fathers death. It has the feel of an old British isles folk song and really evokes the mixture of sensations we all have at these sad times. It is a tremendous song, with this being the best lead vocal I have ever heard from Phil, recorded or live. The songs arrangement couldn’t really be improved upon either with James haunting fiddle providing yet more emotional depth and Fred’s dobro playing around the melody and adding texture. Add Chloes lovely harmonies and the song is a fitting tribute, not only to the departed, but also to this bands ability to support each other musically. We speed up on James Shentons tremendous fiddle driven instrumental Stranger, on which he is well supported by Phil on upright bass and Chloe (or Fred)on mandolin. In many ways it highlights the bands instrumental abilities with no lead vocal to focus on, as well as bringing yet more diversity to the recording. This is followed by Superman, a song penned by Fred and with him on lead vocal telling the story of the super hero, with the twist being that he was taken in as a child by Freds family and brought up as his brother! It is, despite the theme, still a strong country song with fiddle and banjo to the fore as well as the usual excellent harmonies. Final mention just had to go to Chloe’s Evangeline, a song that made it’s first appearance on the bands first recording which was an e.p. From memory, the band was still a duo at that time, but I remember reviewing the e.p for a printed magazine back then and expressing amazement that this beautiful song hadn’t been picked up by any number of Nashville country ‘stars.’ It is a gorgeous murder ballad that has everything, drawing the listener in to its emotion tugging clutches more than just about any thematically similar modern ballad can hope to achieve. It’s easy to see why the band decided to record it for this album. Chloe’s vocal is so at home with the song that it could eventually come to define her vocal style. Add to this the bands tremendous harmonies and the much greater depth and quality of the arrangement and generically the song becomes virtually unsurpassable! It’s rare that four people can have fitted together so well musically. To say they complement each other is an understatement and when you accept that whilst Chloe is for most of the time the band’s focal point they all add equally to what this tremendous band have achieved so far and will certainly go on to achieve in the future. As I said earlier go and see them live. You will be in for a real treat, but before doing so buy the album. In fact buy their first recording as well. If you have actually taken the trouble to read this review I guarantee you will love the band. It’s to showcase music of this quality that this website was originally built.